Friday, April 11, 2014 1200 UTC - Tuesday 21 April 2014 2400 UTC. The competition is primarily designed for the Scandinavian countries, but also participants from other countries are welcome. For the Nordic participant, the competition applies as SM and NM, individually and in teams . The two best results from each club will be added together . The best three results for each country are added together. Listen to as many pirate stations as possible during the contest period . 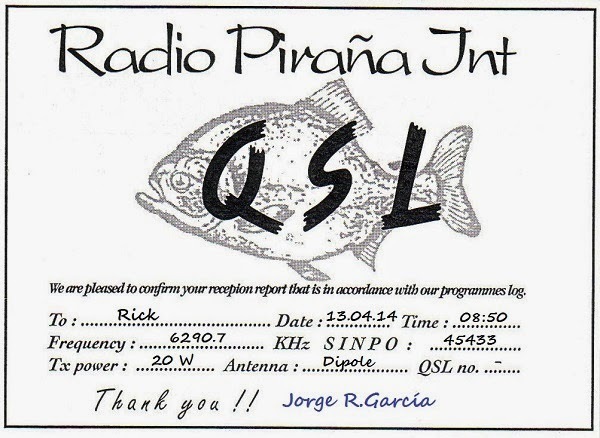 Send reports to stations heard and count the number of QSL received , either by email or letter. All logs must be received by NDL at latest May 20, 2014. Scoring: 1 point for each SW- answer, 2 points for MW answers. All participants will receive a diploma. Additionally award for the best result in any country, NM and SM- winner and a random price . 11401 RWI 08.24- 25332 E, Fr. 11401 RWI 18.04- 45444 E, Fr.